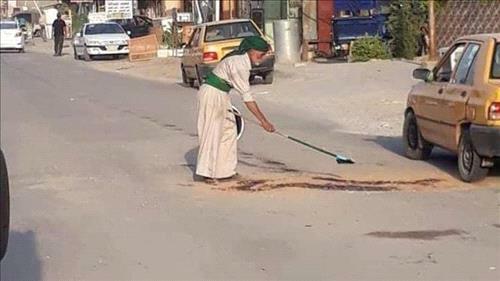 AMMONNEWS - Hakim al-Umaydi, a 61-year-old Iraqi man, has accomplished what the local government in Babel, south of Baghdad, has not been able to do by repairing holes in streets. Umaydi has been doing this voluntary work for two years. A father of six, Umaydi makes a living by driving a transportation car which he also uses to carry the tools for his voluntary work of repairing holes. He got the idea after witnessing an unfortunate incident due to a deep hole in one of the city’s main streets. Tar and sand are the two most important material used to repair holes. Serving the people in his governorate was the goal which pushed him to volunteer and repair holes. Merchants who sell tar and sand have helped him by providing the material for free. Umaydi said voluntary work represents each individual’s national identity, whether he’s young or old, but due to unemployment and unstable economic and livelihood conditions, it may be difficult for one to volunteer hence endeavoring in such efforts has become less and less. He also called on the federal government to provide the basic services and called on youths to work on resolving problems by relying on themselves. Umaydi, however, has joint and spine pain and he needs to travel outside the country for treatment but after losing his passport due to moving out frequently, he couldn’t. Although he paid all the fines, the passports’ department has not yet issued him a new passport. His sons have appealed through Al Arabiya.net the facilitation of the issuance of their father’s passport so he can be treated outside Iraq. People in the city respect and appreciate Umaydi and hope that one day he will be an official in their city.